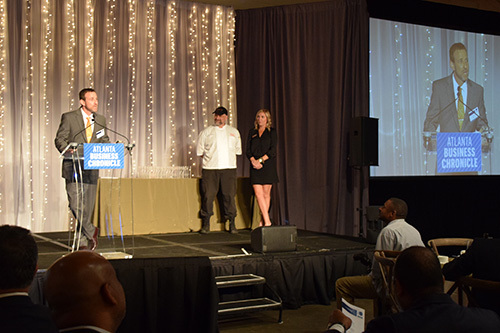 Adam Marcus, PhD, receives award at the Atlanta Business Chronicle's 2016 40 under 40 event. Adam Marcus, PhD, director of the Integrated Cellular Imaging Shared Resource at Winship Cancer Institute, was named to the Atlanta Business Chronicle's 2016 40 under 40 list. The publication, which presented the honor on November 3rd, calls the forty young women and men "metro area movers and shakers." Marcus, an associate professor in the Department of Hematology and Medical Oncology, started his own laboratory in 2006 at Winship and is now a national leader in understanding how cancer cells invade and metastasize. By using a combination of molecular and imaging based approaches, his team has shown how a signaling protein in lung cancer tumors plays a central role in cell migration. He holds several grants from the National Cancer Institute for his research on lung cancer. "Adam is an outstanding young scientist for both the Winship Cancer Institute and for the state of Georgia. He's leading an effort to stimulate critical thinking and enthusiasm for sciences in children, kindergarten through 12th grade. He knows that cultivating future scientists is a smart business strategy," says Walter J. Curran, Jr., MD, executive director of Winship Cancer Institute. Marcus and Theresa Gillespie, PhD, received a $1.2 million R25 Science Education Partnership Award (SEPA) from the National Institutes of Health earlier this year. Only one SEPA grant per institution is eligible for NIH funding throughout the United States. The grant will allow the researchers to create the Center for Advancing Health and Diversity through Citizen Science where Marcus will serve as co-director. The team will focus its efforts on urban underserved and rural Title I schools, and students who are under-represented in STEM fields, including girls and minorities. Marcus is a Georgia Cancer Coalition Distinguished Scholar, American Cancer Society Research Scholar award recipient, and a TEDx speaker. He was honored with a National Lung Cancer Partnership Career Development Award as well as a Fund for Innovative Teaching Award.